Westholme students have competed in the MEM (Mathematical Education on Merseyside) Junior and Senior Challenge 2014 and the UK Intermediate Mathematics Challenge. Students travelled to Liverpool University for the MEM Challenge where they produced solutions to a series of challenging problems. Congratulations to Fiona Olsen won Best in School for the Junior Challenge and to Eleanor Brooks who won Best in School for the Senior Challenge and also won third prize overall! Eleanor has been invited to receive her prize at Liverpool University on 7th May. 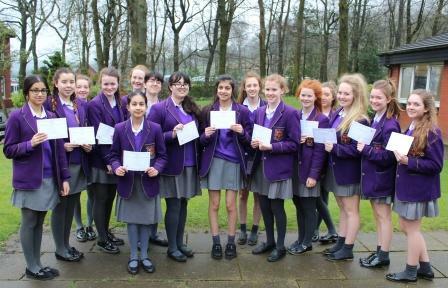 The UK Intermediate Mathematics Challenge involved pupils from Years 9, 10 and 11. Over 200,000 pupils nationwide took part. This year there were 20 girls who were awarded certificates. Kathryn and Louise Jaitly also qualified for the next round of the competition, the European Kangaroo.